On May 10th, 2014 a very special AHAN Milestone Celebration was held at Nippon Kan Headquarters to celebrate many of AHAN’s milestones over the years and Homma Kancho’s 50 years of practice. The celebration was attended by over 350 guests. Greetings from special guest speaker Mayor Wellington Webb, former Mayor of Denver. 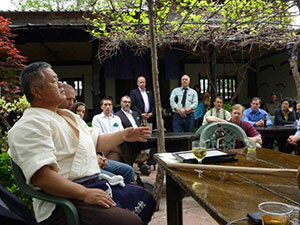 Greeting from special guest speaker Judge Kerry Hada, a prominent Judge and leader of the Japanese Denver community. 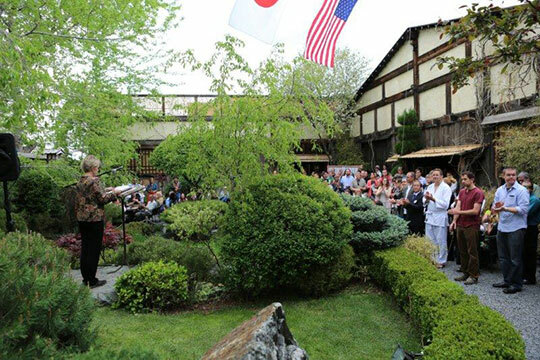 The celebration began with the national anthems of Japan and the USA and reports on AHAN Milestones achievements. Most notable achievements; 70,000 meals served to the homeless in Denver, the building of 10 Learning Centers in Asia and the donation of over 350 tons of rice to children’s facilities worldwide through AHAN. Guest speakers included Mayor Wellington Webb, former Mayor of Denver, Judge Kerry Hada and Mr. George Blankenship. A message from LTC Anup Thapa, Team Leader, Asia and Middle East Team, Department of Peacekeeping Operations, United Nations was on display commending Homma Kancho and AHAN for the development of peace and community relations through Aikido within the Nepalese Army, Ranger Battalions. 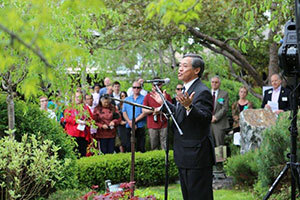 Homma Kancho spoke at the celebration. “It is an important part of the nature of humanitarian projects to be self-funded. Humanitarian efforts cannot truly humanitarian using the money of others. All AHAN Nippon Kan projects are self funded and we do not receive donations from any outside organizations. This milestone celebration is my way of showing appreciation for all of the individuals who have supported AHAN by donating their time and great efforts to make all of these projects “a dream come true”. Homma Kancho enjoying the celebration with his favorite wine. 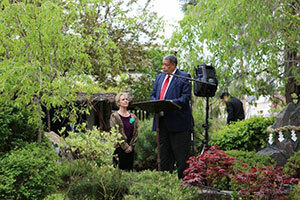 Homma Kancho and his staff created a 27 course gourmet buffet for the celebration that was held in the Nippon Kan gardens. 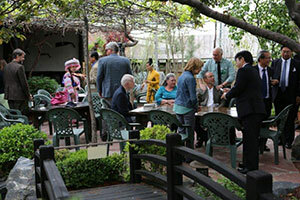 The hundreds of guests enjoyed the luncheon from seating in the gardens, dojo and Domo restaurant dining areas. 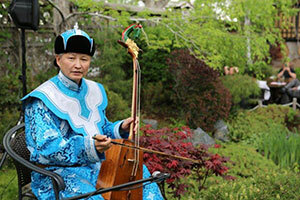 The international buffet was served by Domo staff wearing the traditional clothing of their home countries. Many thanks to Nippon Kan Japan Branch special advisors, Mr. Sugawara, Mr. Shishikura and Mr. Suzuki for traveling from Japan to attend this event and for coordinating many of the “behind the scenes” tasks and duties. ＊Photos in this article have been kept to a minimum for privacy considerations.